Chevy will unveil the 2016 Malibu at the New York auto show on April 1. 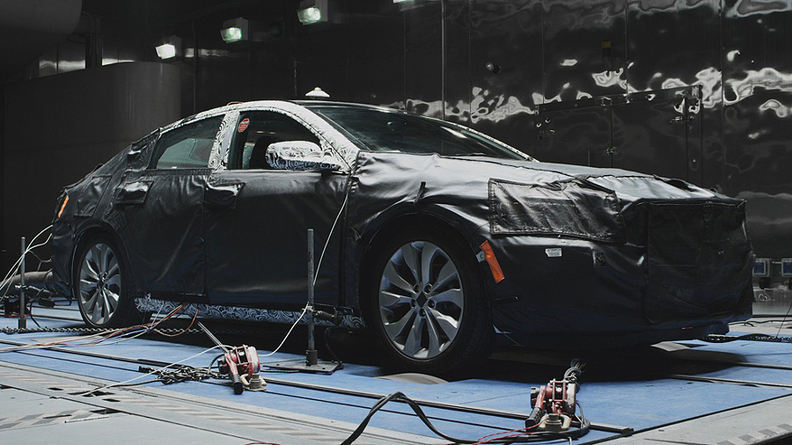 DETROIT -- General Motors released a teaser video of the redesigned, yet-to-be-unveiled 2016 Chevrolet Malibu, showing the midsize sedan being put through the paces at GM's test facilities. The video shows a camouflaged Malibu barreling through deep water, jostling over rumble strips and being blasted at GM's wind tunnel. GM said it has crunched black box data gleaned from its cars dating back to 1972 that "recorded the harshness and frequency of every jounce, bump and shudder inflicted on the car on roads in the U.S., Russia, Saudi Arabia and developing markets." GM engineers have used the data to calculate the amount of damage that 150,000 miles worth of potholes and other hazards will inflict on a Malibu during its life. GM tries to replicate those conditions at its proving grounds in Milford, Mich., where engineers abuse preproduction models. “Although most Malibu owners will never put their car through similar abuse, we test all new vehicles in extreme climates, inclement weather and on punishing road surfaces,” Dan Devine, Malibu validation engineer, said in a statement. Chevy wants to maintain solid quality and reliability rankings racked up by the current Malibu, which was launched in spring 2012 and will stay on sale until the redesign arrives by year end. J.D. Power named the Malibu its highest-rated midsize sedan in both its initial-quality study and three-year reliability study in 2014. Still, the Malibu has been a sales disappointment. Deliveries have fallen every year since 2012, to 188,519 Malibus last year, when it was the only midsize car among the top eight in volume to record a sales decline. Chevy will unveil the 2016 Malibu at the New York auto show on April 1. It's expected to show the next-generation Spark minicar the next day.